We currently do not have a time frame for the release date yet. Our dev team though were already working on this. I have forwarded your request also to the feature request ticket queue so that you will be notified here as soon as there is new update on the status. We are currently working on it. I will update here when it is live. At last but not least, we have just released our new PDF Editor to style submission PDFs and would really appreciate your feedback. In order to get to it: submissions page -> Get PDF -> Customize PDF after clicking Get PDF. Is there any documentation for the PDF Designer? Update: I figured it out. The controls allow me to edit the text on the PDF. A- and A+ decrease and increase the font-size. B add Bold to selected text. The brush changes font color of selected text. The bucket fills background colors, text align tools align selected text, and the highlighter draws a colored border around a selected container. These tools came exactly when I needed them today. I'm glad I discovered them! 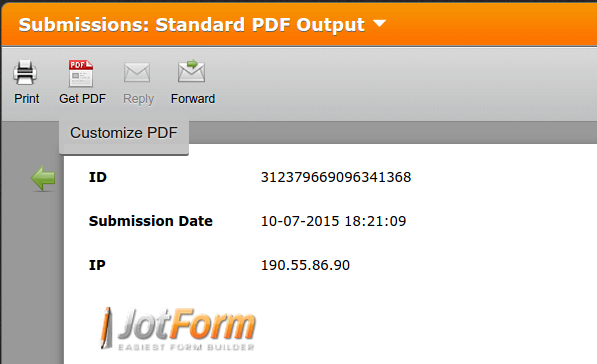 May I kindly suggest that the Jotform forum be updated to remove the old posts that say it is not possible to edit the PDF form. There's a lot of old comments that say its not possible, and very few comments that confirm the existence of this great new feature. Thanks for the great feature upgrade! Where is the submissions page?